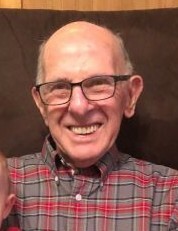 Frederick R. Vokish 86, of Brackenridge, passed away Tuesday, April 2, 2019 in Allegheny General Hospital, Pittsburgh, surrounded by his family. He was born August 24, 1932, in Brackenridge to the late Steve and Theresa Smolen Vokish. Fred was a 1951 graduate of Har-Brack High School. He served as a PFC in the US Army during the Korean War. Fred retired from Highlands School District, where he worked as a custodian. He was a member of Our Lady of the Most Blessed Sacrament R.C. Parish, Our Lady of Perpetual Help Church, Natrona Heights, American Legion Post 226, Brackenridge, and a life member of Pioneer Hose Company, Brackenridge. Fred enjoyed golfing, yard work and spending time with his family. He is survived by his daughter, Arlene (Rick) Graham, of Tarentum; granddaughters, Kaitlyn (Josh) Walters and Alyssa Graham; and by his great-grandson, Mason Walters. In addition to his parents, Fred was preceded in death by his first wife, Frances Kubaska Vokish in 1978; his second wife, Eleanor (Hines) Jones Vokish in 2014; brothers, Steve, Paul, Joseph and Frank Vokish; and by his sisters, Ann Ogurski and Helen Vokish. Friends will be received on Thursday from 2-7 pm in the Cicholski-Zidek Funeral Home, Inc., 1522 Carlisle St., Natrona Heights 724-224-8688, where a parting prayer service will be held on Friday at 9:30 am. Mass of Christian Burial will follow at 10 am in Our Lady of Perpetual Help Church with the Rev. Aaron Kriss as celebrant. Burial with full military honors accorded by the Vandergirft Veterans Honor Guard will be in Mt. Airy Cemetery, Natrona Heights. In lieu of flowers, contributions in memory of Fred may be made to Pioneer Hose Company, 124 Morgan Street, Brackenridge, Pa. 15014. To send an online condolence please visit www.cicholski-zidekfh.com. Pioneer Hose Company will hold services in the funeral home on Thursday at 6:00 p.m.